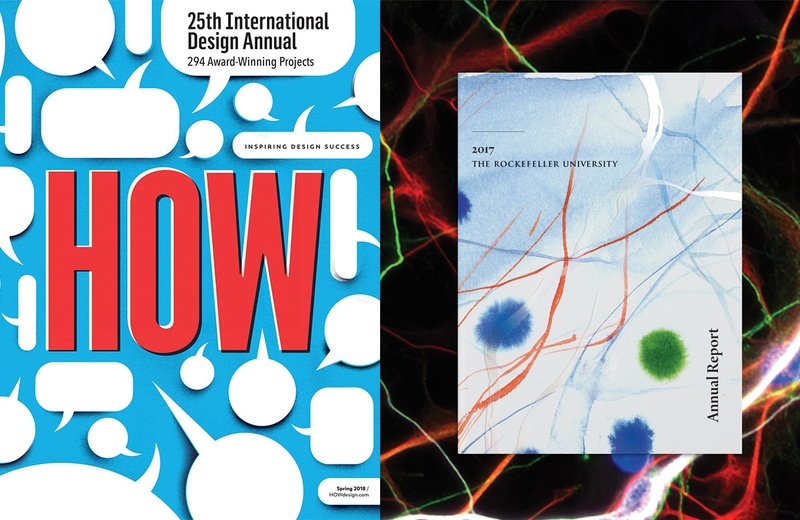 Transforming bioscience into modern art is the heart of the 2017 Rockefeller University Annual Report, that won a 2018 HOW International Design Award in the Annual Reports/Brochures category. 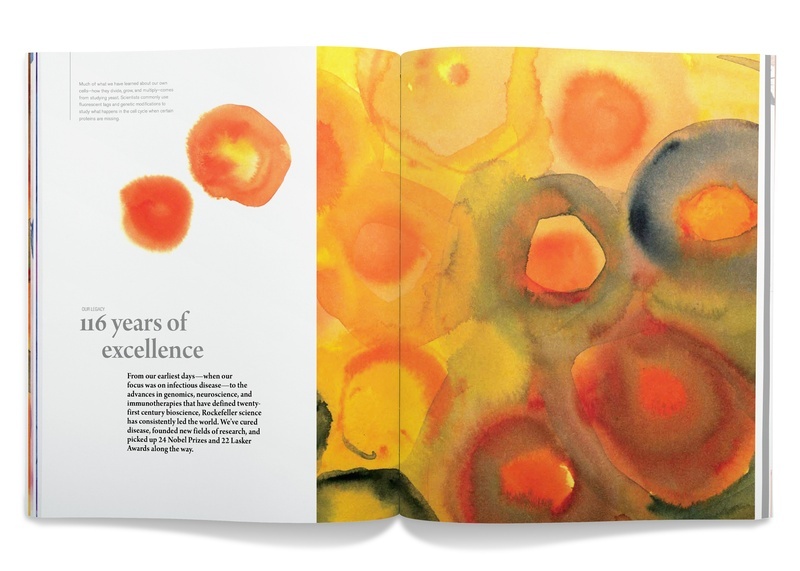 The print annual report and accompanying website feature actual biomedical imagery generated in University labs that were converted it into watercolors. The design is refined and subdued but pops off the page, highlighting the University's unique approach to bioscience. 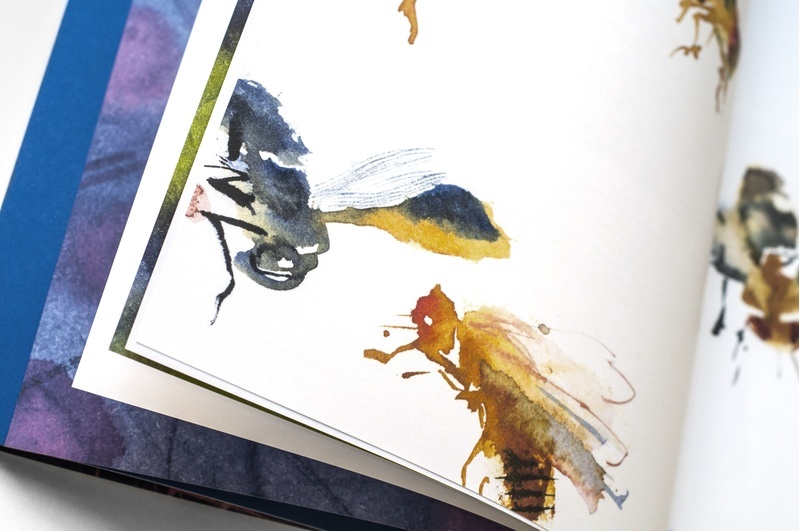 The studio developed the design concept, identified the scientific images and worked with watercolor artist Deborah Ross, who created the resulting artistic images for the annual report. The use of high-quality printing techniques including pearlized foil stamp conveys a sense of understated premium quality. Engaging hands-on portraits, quotes, and a focus on actual biomedical discovery tell the story of individual students and faculty at this world-class research oasis in the heart of Manhattan. This visual technique became one of the signature design element for the University’s communications materials, with the juxtaposition of science and art underscoring the essence of the institution. The project has been covered in various press outlets. C&G has also completed the branding strategy, print design (brochures, annual report, prospectus), campus maps, kiosks, signage, and a website (strategy, design, information architecture, user interface design, front-end development) for The Rockefeller University.